Lotto Social welcomes a brand new lottery onboard, welcome the Irish Lotto! Right here, you’ll find all you need to know! Including: Draw times, prize tiers, odds of winning & how you can increase your chances for the upcoming draw (more on that later). Jackpots start at around 1.4M and often pass the 4M mark. The lottery itself requires players to select six numbers from 1 to 47, seven numbers are then drawn, consisting of 6 main numbers and one bonus number. To win, your numbers must match all 6 numbers. Play a part in the draw and get your lines on either Wednesday or Saturday, the draw normally closes at around 8pm (GMT). Irish Lotto prizes consist of 8 tiers, the odds of winning are illustrated in the table below. What’s The Highest The Irish Lotto Has Ever Been? The biggest Irish Lotto win in history occured back in 2008, when a lottery syndicate of 16 shared a collosaul 18.9 million jackpot. 15 quarry workers hit the jackpot whilst playing in a syndicate with each employee taking home at least around 1.18 million each. What Is The Jackpot Cap For The Irish Lotto? The jackpot cap is currently set at 18.96 million, once rolled-over no more will be added to the jackpot until it is won. 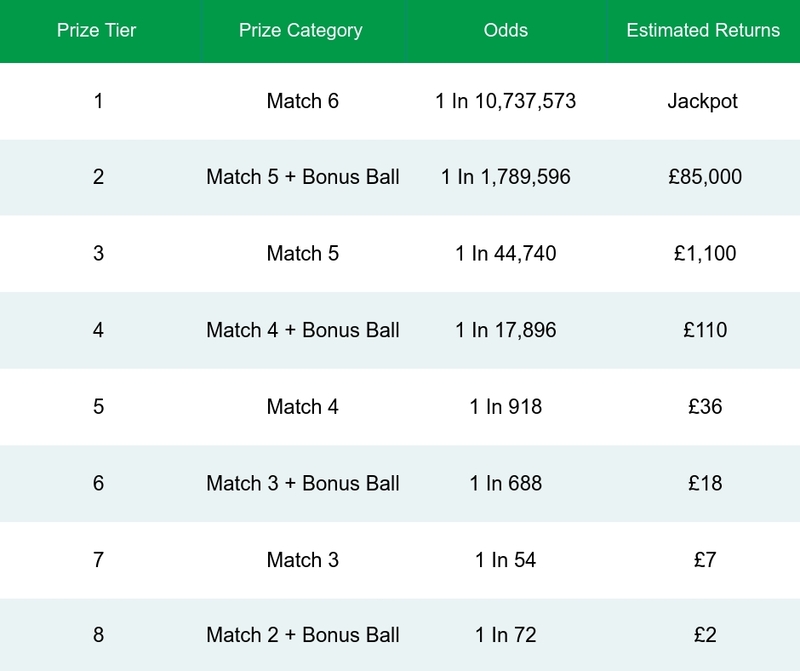 If however there are no winners matching all 6 numbers then ticket sales that would be added to the jackpot will instead be used to bolster the next tier prize (Match 5 + Bonus Ball, as seen in the table above). How Can You Increase Your Chances For The Irish Lotto? If you want to increase your chances of winning the Irish Lotto, shorten your odds instantly by playing in a lottery syndicate. With us, we’ll give you 10 lines for the Irish Lotto, 5 for Wednesday, 5 for Saturday for just 3.99. Best of all, when you join, we automatically place you in a syndicate of up to 49 players, ultimately increasing your chances of winning. Check our what our members have to say: Trust Pilot.